The Oldenburg Registry North America and International Sporthorse Registry (ISR-Oldenburg NA) - was founded in 1983. North America needs an independent Sport Horse Breed Organization which works on the basis of 200 years of European experience and as successful as European registries. America needs its own source for the sport horses of the future! These three standards helped to achieve our top quality of sport horses bred in North America! The Registry conducts a sophisticated, competitive breeding program through the careful selection, testing and approval of stallions and mares and through the evaluation and registration of offspring. The Registry's breeding goal to produce modern sport horses, competitive to the horses from Europe and most suitable for dressage or hunter and jumping sports has been achieved. Let us know, if there is no site close to you, so we can find a solution. Always check for later changes and additions. See Sales List in the left menue. You'll find many photos of awarded horses and premium foals of 2018 in the FIVE new Photo Galleries. Check under Awards. Congratulations to the winners of the High Point Oldenburg Awards at the USDF Dressage Finals! The winners receive a nice saddle pad from the Registry. We uploaded all 2019 approved stallions to the Detailed Stallion List with links to the Performance and USDF site and to their photos. Members find more infos (registered foals, test results, pedigrees etc.) about each stallion in the MEMBER section. All registration papers of the 2018 inspections have been mailed. Get back to the office asap, in case you did not receive your papers! All mares that received a Star Award in 2018 have been uploaded to the website. Check under AWARDS. You now find ALL 2018 High Score and Premium Foals and Mares online! Please check under AWARDS. You'll find them under AWARDS. Congratulations to our breeders and owners! The champion of each class and level will receive a wonderful silver frame. USDF will mail medals with neck ribbons to each champion and reserve champion. Congratulations! These stallions have been approved in 2018. More details about these stallions will be uploaded in November! 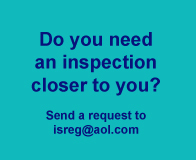 If there is no inspection site close to you or if you want to register an older horse or did not have the chance to come to an inspection, contact the office at isreg@aol.com for forms to register your horse by mail. The registry offers breeders a test via UC Davis. Forms may be retrieved from the section: Services/Forms-Download Forms. For details about this test and results check the info from UC Davis.